It was Aug. 14, 2017, just one week before the Moon would cross paths with the Sun and Earth, casting its shadow across the United States. The entire country buzzed with anticipation for the fleeting chance to see the corona, the Sun’s tenuous outer atmosphere. The Predictive Science researchers used data from NASA’s Solar Dynamics Observatory, or SDO, to develop a model that simulates the corona. Their model uses measurements of magnetic fields on the Sun’s surface to predict how the magnetic field shapes the corona. Their work was supported by NASA, the National Science Foundation and the Air Force Office of Scientific Research. Mikić is the lead author of a paper summarizing their work and published in Nature Astronomy on Aug. 27, 2018. 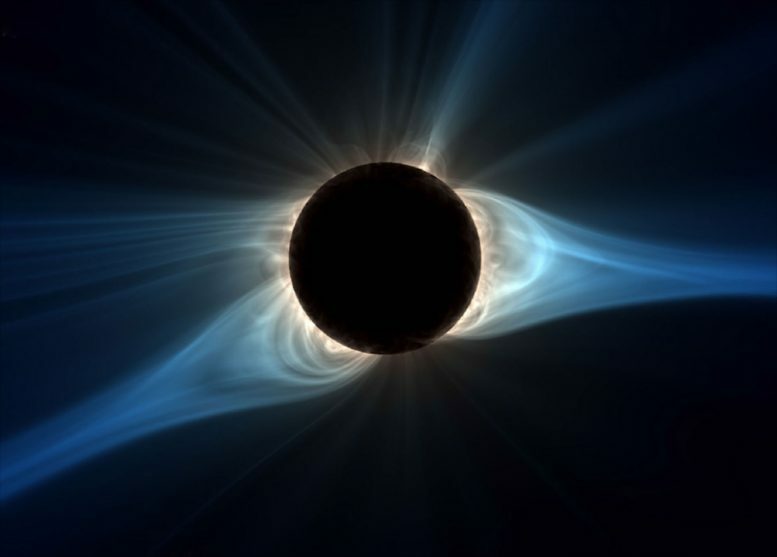 Predictive Science Inc. developed a numerical model that simulated what the corona would look like during the Aug. 21, 2017, total solar eclipse. Greater complexity demands more computing hours, and each simulation required thousands of processers and took about two days of real time to complete. The research group ran their model on several supercomputers including facilities at the University of Texas at Austin’s Texas Advanced Computer Center; the San Diego Supercomputer Center at the University of California San Diego; and the Pleiades supercomputer at the NASA Advanced Supercomputing facility at NASA’s Ames Research Center in Silicon Valley, California. The researchers also included new calculations for coronal heating. We don’t yet understand how the corona blazes upwards of 2 million degrees Fahrenheit, while just 1,000 miles below, the underlying surface simmers at a balmy 10,000 F. One theory proposes electromagnetic waves — called Alfvén waves — launched from the Sun’s churning surface rush out into the corona, heating particles as they propagate outwards, a bit like how ocean waves push and accelerate surfers toward the shore. 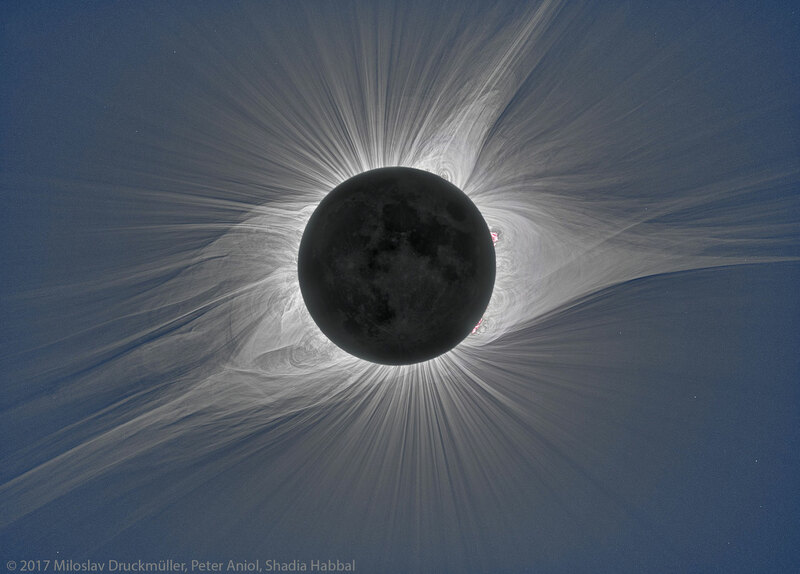 A composite image generated from photographs taken on the day of the total eclipse. By accounting for prominences and these tiny — but numerous — waves, the scientists hoped to paint an increasingly detailed portrait of the corona’s complex behavior. One discrepancy between the prediction and the observations is a skinnier feature, called a pseudostreamer, that jets out from the Sun’s upper-right. The researchers determined their model missed the pseudostreamer because the magnetic field changed in that specific region during the data collection. A different model’s prediction successfully captured this pseudostreamer, Mikić said, because it appears to have estimated the magnetic field more accurately there. Parker Solar Probe will send back to Earth observations from inside the corona itself, which researchers can add to their models, filling crucial knowledge gaps in the corona’s complicated physics. Mikić said models like theirs can complement the mission by contextualizing the spacecraft’s journey through the corona. Scientists have never worked with data collected so close to the Sun. By modeling the entire corona — the bigger picture — researchers will provide crucial perspective on Parker’s surroundings as it ventures into entirely unexplored territory. Be the first to comment on "How Scientists Predicted the Corona for the August 2017 Total Solar Eclipse"